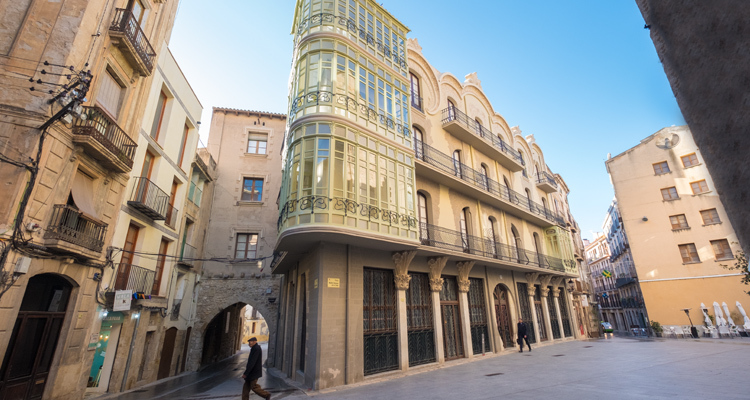 Modernisme was an important movement in Tortosa, spearheaded by two key architects, Pau Monguió and Joan Abril, who would spark an architectural, social and technological awakening in the city in the early 20th century. Following the demolition of several sections of walls at the end of the 19th century, the expansion district was constructed. Bourgeois families, some with links to industries that played a major role in the city’s economy, built houses there. 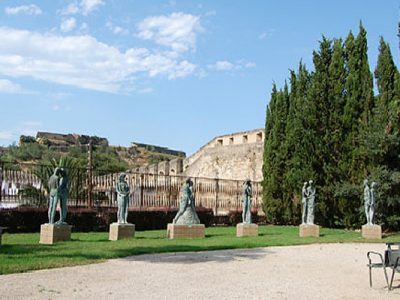 This tour starts at Tortosa Museum of the History and Archaeology of the Terres de l’Ebre, located in the old municipal slaughterhouse. We will see an imposing building formed by a structure of several pavilions built and decorated with brick, ceramics and glazed tiles. 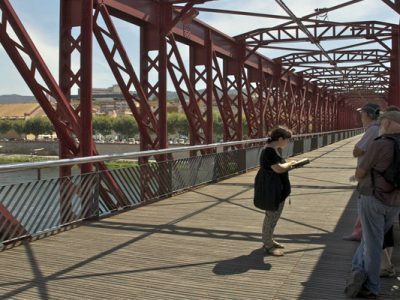 This is a Modernista building designed by the architect Pau Monguió and built between 1906 and 1908 on land gained from the Ebro River. It is an original building that never fails to surprise visitors. 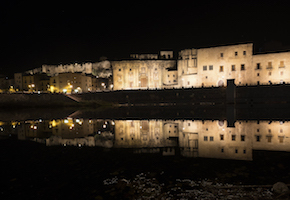 It houses the Tourist Office and the Museum of Tortosa, and a permanent exhibition that outlines the history of Tortosa and its area of influence, from prehistory to the present day, and the most representative works from each historical period. Next, if we walk towards the cathedral with the river on our right, we will see another outstanding building on our left, the Palau Montagut. Palau Montagut. 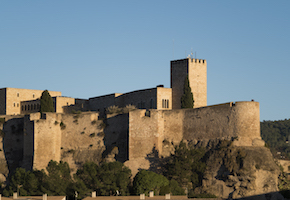 The palace complex includes the Tamarit gate, one of Tortosa’s medieval gates through which each of the stone blocks used to build the cathedral was passed, one by one. The Montagut coat of arms can be seen above the front door, carved in stone. The building stands out for its circular tower and, above all, the attractive cone-shaped ceramic roof that tops it. 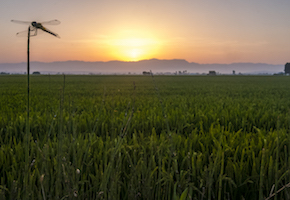 At the moment it serves as the headquarters of the Ebro Leftside Irrigation Community. If we walk round the Cathedral into the Plaça de l’Absis, we shall come to Plaça de la Cinta. As we approach, appears an imposing and elegant building. Casa Grego. 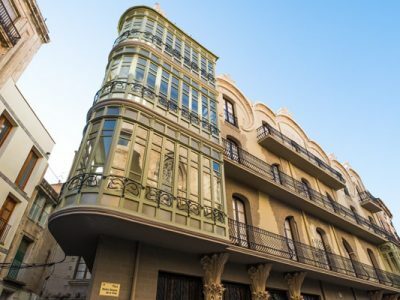 In Plaça de la Cinta and at the Romeu Gate, this elegant Modernista house stands out for its geometric decoration, its rounded, sinuous shapes, and a dynamism so common in Modernisme. The use of sgraffiti portraying naturalistic themes and the omega-shaped archway at the main entrance are also very characteristic of this style. This building is also the work of Pau Montguió. Next, let us be swept away by the charm of Tortosa’s old town, pass through the intriguing Romeu Gate and cross Plaça dels Dolors towards Carrer Montcada, a narrow street and one of the oldest, a very important route in days gone by. Palau Climent. If we look up, we shall see a small palace with a wooden bay window that lends the building a highly unusual appearance. 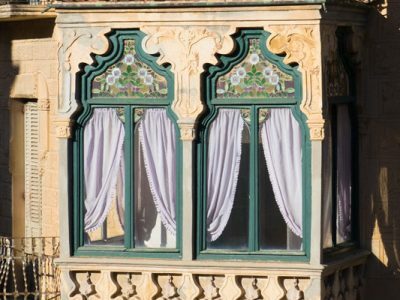 The main façade, decorated with a plant design, stands out for its beautiful wrought-iron balconies. While here, it is worth exploring the street, which features numerous delegations and many of the city’s official buildings. 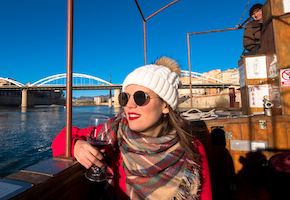 Then go straight on until reaching Carrer de Sant Blai, which boasts dozens of shops and businesses where visitors to Tortosa can indulge in a spot of shopping. 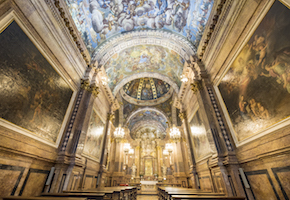 If we walk along Carrer de Sant Blai to Carrer de Cervantes, just where one street ends and the other begins, we will come across two of Tortosa’s most remarkable Modernista buildings. Casa Matheu. On one side we’ll see Casa Matheu, also the work of architect Pau Monguió. The plant design features mainly on the chamfer, around the openings, and in the bay window, which has beautiful leaded stained glass. One of the house’s most eye-catching features is the oriel window, which is decorated with plant motifs. 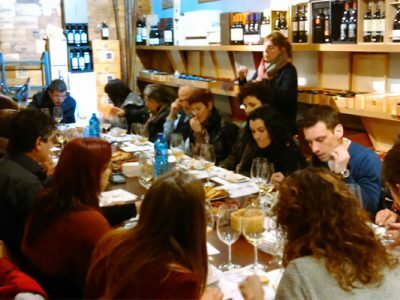 Casa Matheu has several restaurants nearby for a welcome rest or a bite to eat for those who need it. If it happens to be the evening and the weather is good, simply soak up the wonderful atmosphere in this part of the city. Casa Brunet. 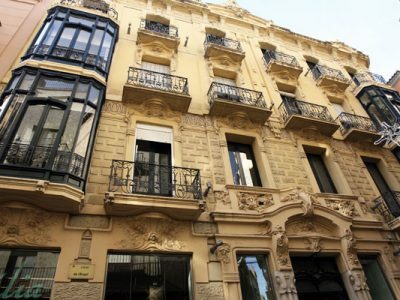 On the other side of Casa Matheu stands the imposing Casa Brunet, located on Carrer de Cervantes. 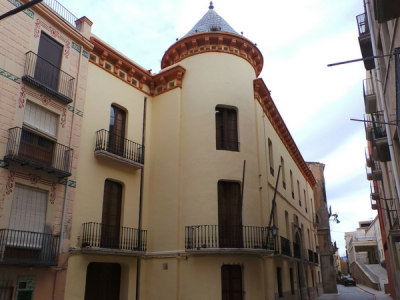 It currently serves as the headquarters for the Chamber of Commerce, Industry and Navigation of Tortosa. With its Baroque forms, the building’s robustness and weight are balanced by the decoration of the pillars and pediments that, together with the mouldings and upper cornice, gives it a certain dynamism. Carrer de Cervantes is another noteworthy street in the city’s expansion district. This bustling street boasts numerous shops, as well as bakeries, restaurants and ice-cream shops that are perfect for resting and recovering your strength. If we continue along this street and head towards Carrer de Ramon Berenguer IV, another remarkable house comes into view, Casa Bau. Casa Bau. The building’s main façade follows a strict central symmetry, where a Gothic stone oriel window decorated with pinnacles and gargoyles provides the Modernista look typically sought by the bourgeoisie. 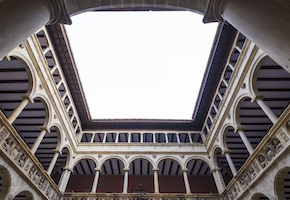 Today it serves as the headquarters for the Association of Architects of the Terres de l’Ebre and the Association of Journalists of the Terres de l’Ebre. Once here, we recommend turning back towards Plaça d’Alfons XII, rather than carrying on up this street. Clínica Sabaté. The building that houses the old clinic is one of the most unusual structures in the city. 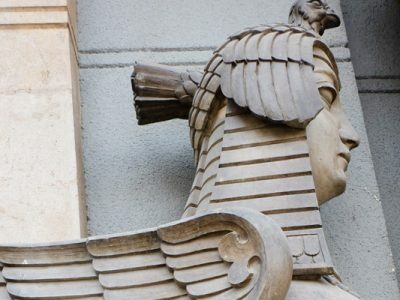 It has a strong eastern influence in the Egyptian decorative motifs that give it a unique character, and at the entrance, which is flanked by two stone sphinxes. The building is located right on Plaça d’Alfons XII, in the very heart of the city. As we head down Avinguda de la Generalitat, we are immediately struck by the imposing municipal food market. Rather than just observe the building from outside, why not go in and enjoy the huge variety of fresh, local produce on offer? Municipal market. 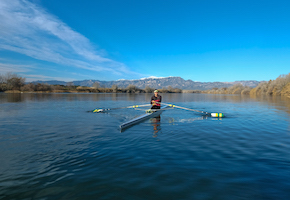 The market was built on the old course of the Ebro river between 1884 and 1887. 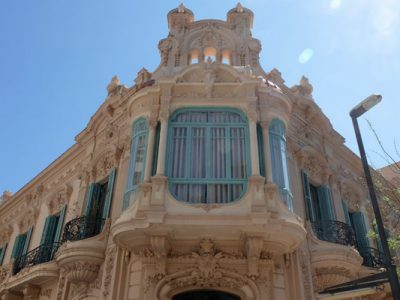 It represents a fascinating example of eclectic Catalan architecture. The metallic structure that supports the municipal market was designed by Joan Torras i Guardiola, who was nicknamed “The Catalan Eiffel”. 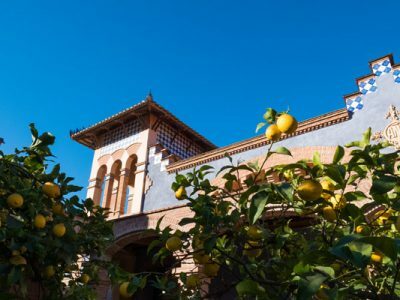 Work on the project has traditionally been attributed to Joan Abril i Guanyabens, although he was only commissioned as the municipal architect during one of the phases. Finally, we conclude our Modernista tour in the city’s municipal park. The municipal park is currently home to the old Corn Exchange. 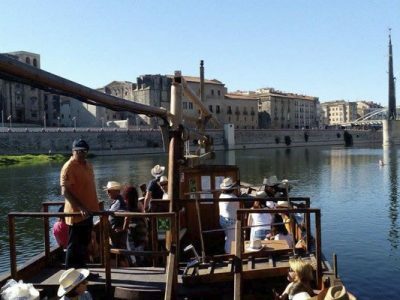 The city council started construction on the Llotja in 1368 in the square on the Rambla, next to the Ebro river. Back in those days, it was used for commercial purposes such as ordering and delivering goods. Following numerous fateful historic events that resulted in a great deal of damage, and after being used as a warehouse for military equipment in 1848, it was about to be destroyed when the council agreed to demolish it in September 1932. The north-eastern end of the park is home to the part that remained, the “grain porch”, which was moved and rebuilt exactly as before, stone by stone, by the Catalan government. It now houses the giants of the city and traditional festival figures.